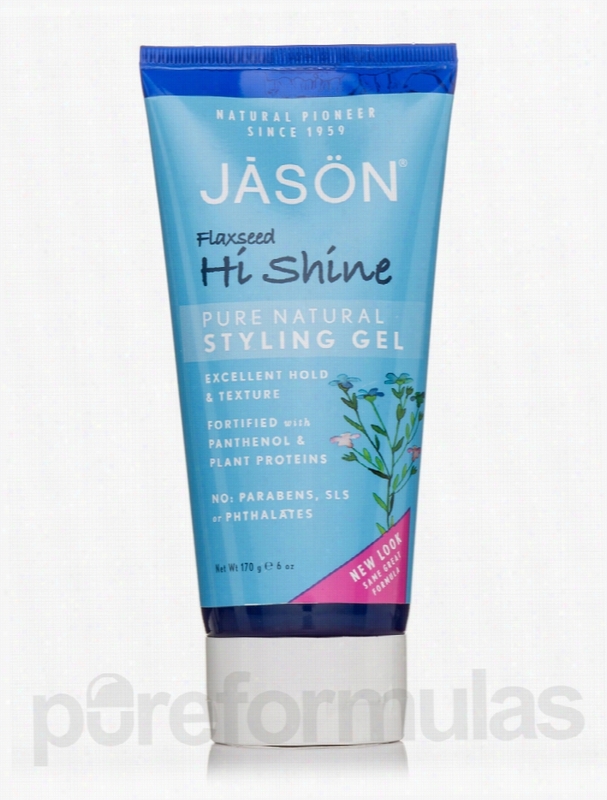 Jason Natural Products Hair - Flaxseed Hi Shine Styling Gel - 6 oz. This high performance advanced styling hair Gel delivers salon quality texture&sbquo; shape and shine to all hair types. Jason Naturals Unique blend of Panthenol&sbquo; Plant Proteins and Extracts plus Flaxeed (Linseed) adds body and volume with great structure and a lustrous shine. Suitable for color-treated or permed hair. These statements have not been evaluated by the Food and Drug Administration (FDA). These products are not meant to diagnoseÃ¢ÂÂ treat or cure any disease or medical condition. Please consult your doctor before starting any exercise or nutritional supplement program or before using these or any product during pregnancy or if you have a serious medical condition. Jason Natural Products Skin Care - Soothing 84% Aloe Vera Cream - 4 oz. When you are looking for deep hydration and moisturization and want to calm skin irritation&sbquo; you may choose Soothing 84% Aloe Vera Cream from Jason&trade; Natural Products. With a botanical line of ingredients&sbquo; this moisturizing cream could penetrate dry skin and nourish it. Aloe vera juice may calm irritation and itchiness on dry skin. It might soothe sunburns and hydrate just-shaved skin. Sweet almond oil and vitamin E contents in the cream could come in handy in to make your skin healthy and conditioned. They might promote skin elasticity. Sunflower seed oil in the cream from Jason&trade; Natural Products could seep deep inside the epidermal layers and nourish it. Avocado oil retains and locks moisture in the skin all day long to leave it looking replenished. It may also reduce dry skin patches during climate changes. 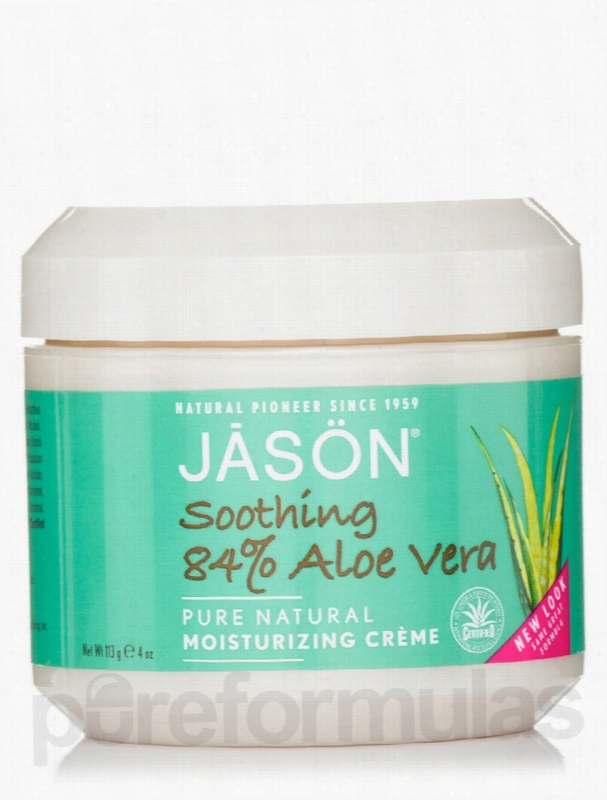 Soothing 84% Aloe Vera Cream 4 oz from Jason&trade; Natural Products may be beneficial in nourishing and hydrating dry skin. These statements have not been evaluated by the Food and Drug Administration (FDA). These products are not meant to diagnoseÃ¢ÂÂ treat or cure any disease or medical condition. Please consult your doctor before starting any exercise or nutritional supplement program or before using these or any product during pregnancy or if you have a serious medical condition. Jason Natural Products Hair - Tots Tangle Taming Leave-In Spray Fruit. Earth's Best&trade; TOTS Tangle Taming Leave in Spray gives knots and snarls the slip for easy brushing both wet and dry. Say goodbye to tangles and tears. Say hello to soft&sbquo; smooth hair.Natural formula contains no artificial colors or fragrances&sbquo; phthalates&sbquo; sodium lauryl/laureth sulfate&sbquo; sodium methyl sulfate&sbquo; parabens or harsh preservatives. 100% Vegetarian. No Animal testing. These statements have not been evaluated by the Food and Drug Administration (FDA). These products are not meant to diagnoseÃ¢ÂÂ treat or cure any disease or medical condition. Please consult your doctor before starting any exercise or Nutritional supplement program or before using these or any product during pregnancy or if you have a serious medical condition. 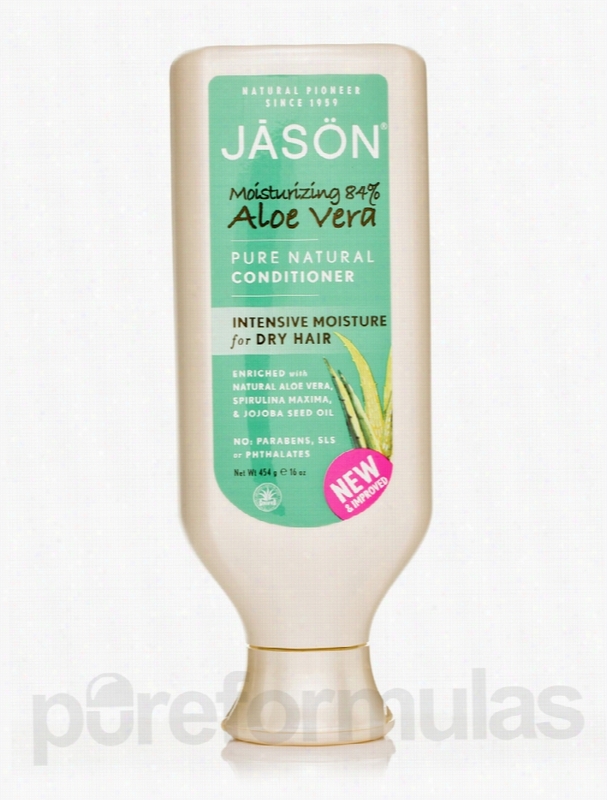 Jason Natural Products Hair - Moisturizing 84% Aloe Vera Conditioner -. If you are looking for a supplement that conditions&sbquo; strengthens and hydrates dry hair&sbquo; you could try Moisturizing 84% Aloe Vera Conditioner from Jason&reg; Natural Products. Sunflower and Jojoba oils aid in nourishing your hair and giving it more shine. Aloe Vera present in this supplement from Jason&reg; Natural Products contains phytochemicals and enzymes that may be beneficial to hair health. It could also moisturize the scalp and maintain its pH balance. Spirulina maxima is an algae that is high in nutrients like amino acids&sbquo; essential fatty acids and beta-carotene that could condition your hair and leave it stronger and glossier. This conditioner contains Jojoba seed oil that may hydrate and strengthen weak hair. 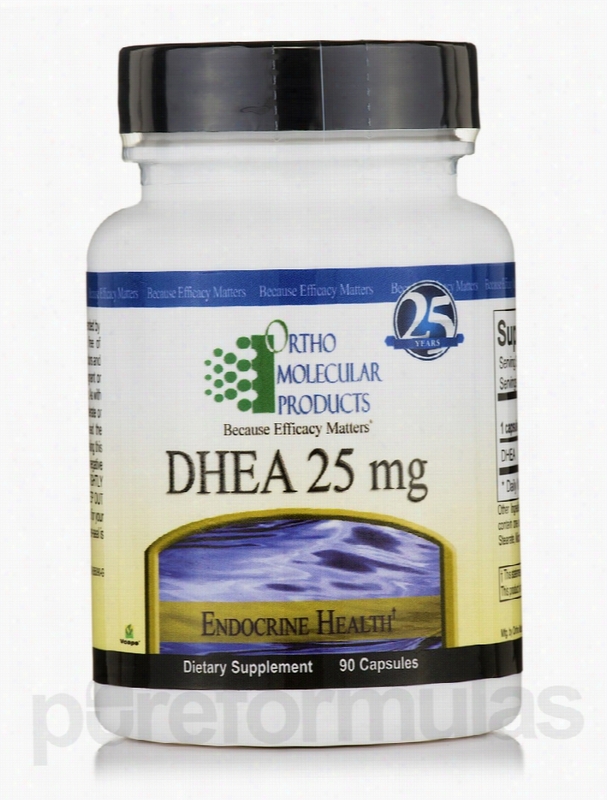 Vitamin E&sbquo; a fat soluble vitamin&sbquo; has antioxidant properties and could improve blood flow to the scalp. Vitamin E may be beneficial in adding gloss and smoothness to your hair. Equisetum arvense leaf extracts contain silica that could add softness and vitality to your hair. Switch to Moisturizing 84% Aloe Vera Conditioner from Jason&reg; Natural Products that could enhance your hair health. These statements have not been evaluated by the Food and Drug Administration (FDA). These products are not meant to diagnoseÃ¢ÂÂ treat or cure any disease or medical condition. Please consult your doctor before starting any exercise or nutritional supplement program or before using these or any product during pregnancy or if you have a serious medical condition. 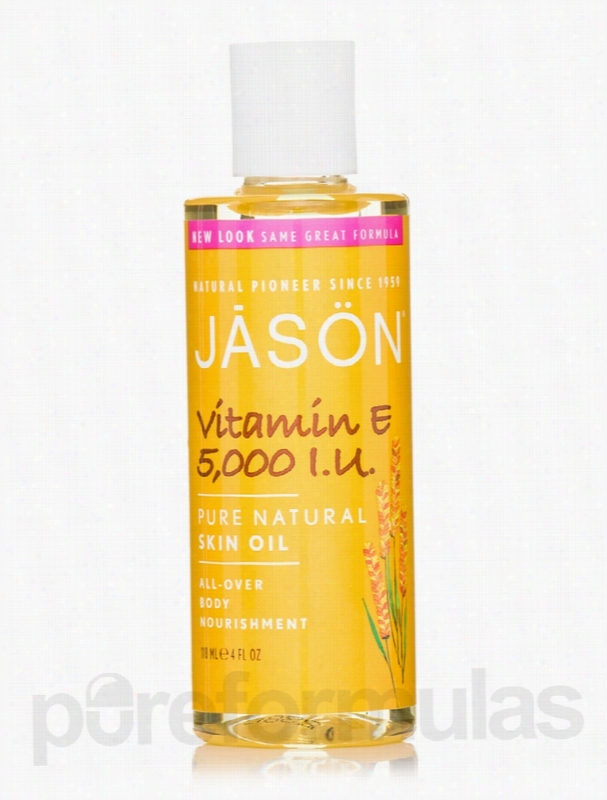 Jason Natural Products Skin Care - Vitamin E Oil 5,000 I.U. Skin Oil -. Vitamin E Oil 5&sbquo;000 I.U. Skin Oil from J&#256;S&Ouml;N&reg; Natural Products may provide the benefits associated with various essential oils and vitamin E. The skin is always exposed to harmful rays from the sun and environmental pollutants like smoke and dust; therefore it is important to take care of it. This enriched oil from J&#256;S&Ouml;N&reg; Natural Products contains five essential oils: almond&sbquo; apricot&sbquo; avocado&sbquo; sunflower&sbquo; and wheat germ. These oils may be able to nourish the skin and restore its softness. Exposure to sunlight may accelerate the aging of the skin and applying nourishing oil like this one could reduce the appearance of age lines and wrinkles&sbquo; especially because it contains vitamin E. Vitamin E is called an Antioxidant vitamin and may protect the body from the harmful effects of free radicals. Free radicals are dangerous molecules that may cause harm at a cellular level. Antioxidants could curb or prevent the activity of these molecules and protect the skin from damage. Gently massage the Vitamin E Oil 5&sbquo;000 I.U. Skin Oil from J&#256;S&Ouml;N&reg; Natural Products on the face and body for maximum nourishing benefits. These statements have not been evaluated by the Food and Drug Administration (FDA). These products are not meant to diagnoseÃ¢ÂÂ treat or cure any disease or medical condition. Please consult your doctor before starting any exercise or nutritional supplement program or before using these or any product during pregnancy or if you have a serious medical condition. Jason Natural Products Hair - Normalizing Tea Tree Treatment. Normalizing Tea Tree Treatment Conditioner 8 oz (227 Grams) is a formula from Jason&reg; Natural Products that helps soothe and nourish dry scalp. In addition&sbquo; this product may also help moisturize your hair&sbquo; add body to it and make it more manageable. Tea Tree oil present in this conditioner appears to have antiseptic and antimicrobial elements that could ward off flakiness and itchiness caused by irritants. It is gentle and leaves the hair fresh and invigorated. Jojoba seed oil is rich in fatty acids and vitamins that could hydrate the hair&sbquo; soothe dry scalp and add body and elasticity to the hair. Aloe vera present in this product from Jason&reg; Natural Products is rich in minerals&sbquo; vitamins&sbquo; amino acids and enzymes and could decrease the symptoms associated with a dry and itchy scalp. It might be helpful in controlling frizzy hair leaving your hair soft&sbquo; beautiful and sleek. Sea algae extracts could nourish and hydrate the scalp and hair. Biotin and panthenol are B-vitamins that could also promote healthy hair. 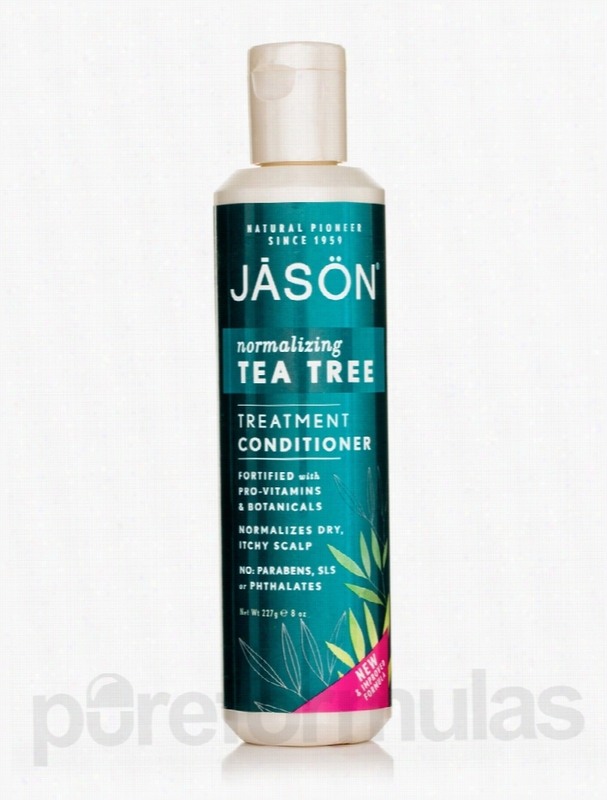 Get Normalizing Tea Tree Treatment Conditioner 8 oz (227 Grams) from Jason&reg; Natural Products for enhancing the health of your hair. These statements have not been evaluated by the Food and Drug Administration (FDA). These products are not meant to diagnoseÃ¢ÂÂ treat or cure any disease or medical condition. Please consult your doctor before starting any exercise or nutritional supplement program or before using these or any product during pregnancy or if you have a serious medical condition. Jason Natural Products Skin Care - C-Effects Natural Creme - 2 oz (57. C-Effects Natural Cr&egrave;me from Jason&reg; Natural Products is a natural product that may protect your skin from the changes of aging. This formula contains vitamin C&sbquo; thioctic acid&sbquo; vitamin E and green tea could have Antioxidant properties&sbquo; among other natural extracts. Aging takes a toll on skin health. Apart from sun exposure and pollution&sbquo; free radicals could also accelerate skin damage with age and breakdown collagen and reduce skin elasticity. Vitamin C in this product from Jason&reg; Natural Products may inhibit collagen breakdown and neutralize harmful free radicals&sbquo; thereby maintaining younger looking skin. Thioctic acid&sbquo; also known as alpha lipoic acid may help your body recycle other antioxidants like vitamin C and E and keeps your skin soft&sbquo; glowing and wrinkle-free. Sunflower seed oil and shea butter may nourish and hydrate skin. Vitamin E could leave the skin smooth and hydrated. Another benefit is that it could revitalize skin. Green tea extracts are rich in antioxidants that may protect your skin from the signs of aging. 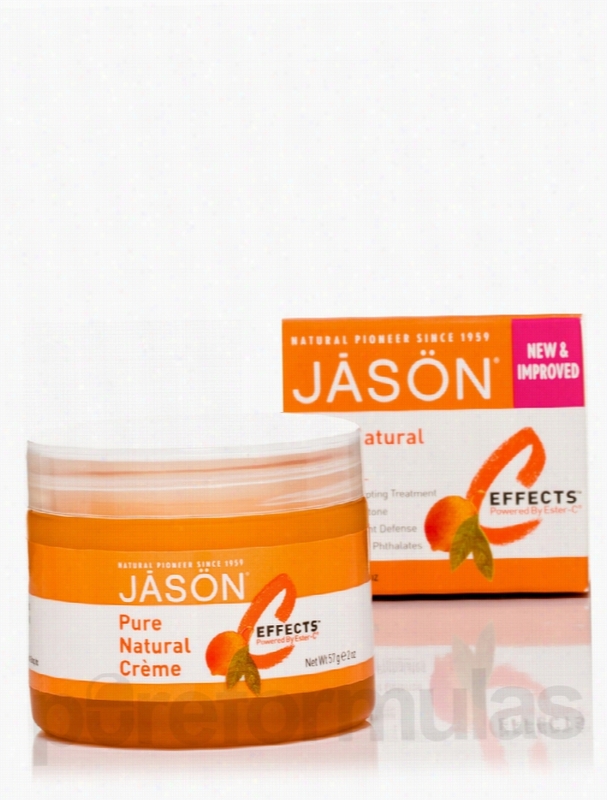 Boost skin health with C-Effects Natural Cr&egrave;me from Jason&reg; Natural Products. These statements have not been evaluated by the Food and Drug Administration (FDA). These products are not meant to diagnoseÃ¢ÂÂ treat or cure any disease or medical condition. Please consult your doctor before starting any exercise or nutritional supplement program or before using these or any product during pregnancy or if you have a serious medical condition. Jason Natural Products Skin Care - C-Effects Pure Natural Super-C. 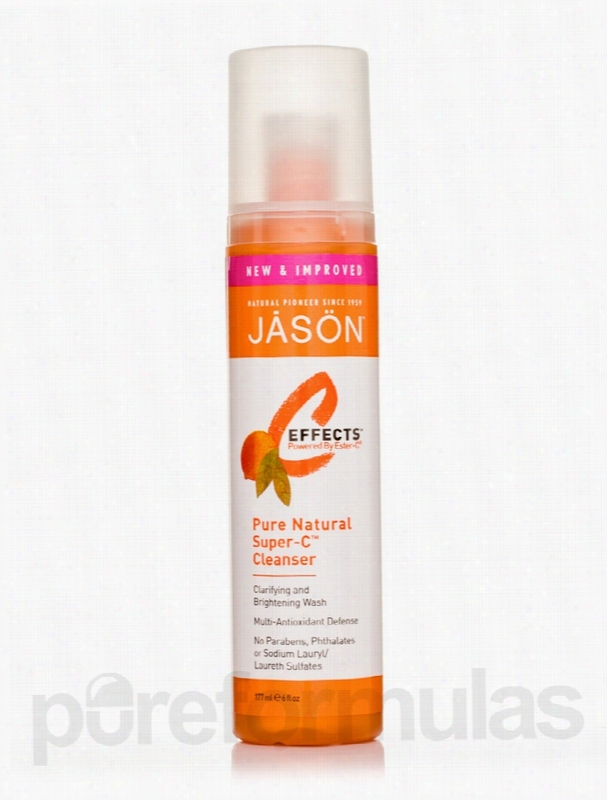 If you want remove excessive makeup build-up from your skin and allow it to breathe easy&sbquo; you may want to use C-Effects&trade; Pure Natural Super-C&trade; Cleanser from Jason&trade; Natural Products. 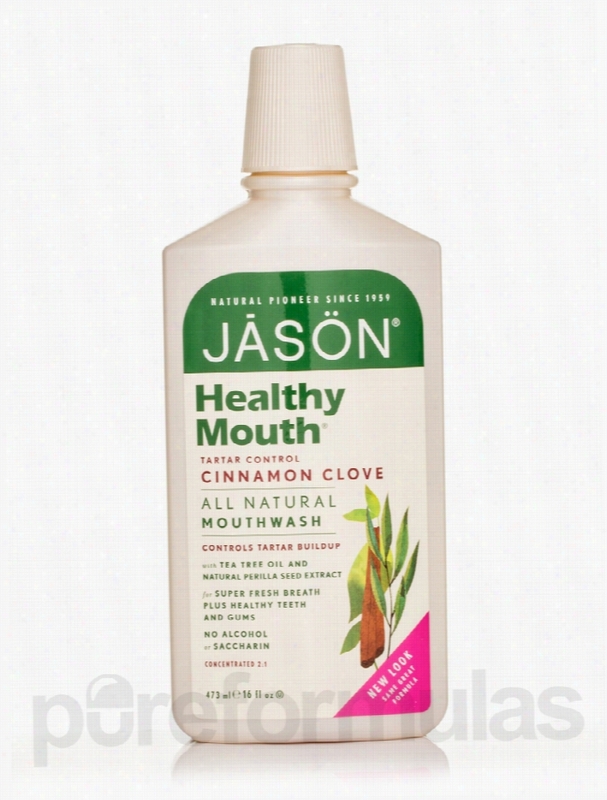 Using this makeup cleansing product from Jason&trade; Natural products could remove all traces of makeup&sbquo; dirt and excess oil from your face effectively. Made from natural herbs and skin-friendly ingredients&sbquo; this cleanser contains organic Aloe leaf juice to hydrate your skin and ensure that its natural moisture is not ripped off during the cleansing action. Orange and ascorbic acid are sources of vitamin C that may reduce wrinkles on your face and even out your skin texture. Other sources of vitamin E in this cleanser may improve your skin&rsquo;s elasticity and leave a refreshing glow on your skin. Glycerin could enrich your skin cells with enough moisture and ensure deep cleansing of the accumulated product build-up. Leaving your skin squeaky clean yet hydrated is now quick and easy with C-Effects&trade; Pure Natural Super-C&trade; Cleanser from Jason&trade; Natural Products. These statements have not been evaluated by the Food and Drug Administration (FDA). These products are not meant to diagnoseÃ¢ÂÂ treat or cure any disease or medical condition. Please consult your doctor before starting any exercise or nutritional supplement program or before using these or any product during pregnancy or if you have a serious medical condition.